I picked up a lot of interesting British words and expressions during the two years that I lived in London. I love this word, and it is exactly how I was feeling when my Eremurus himalaicus started flowering for the first time this year. I purchased the roots for this plant in the autumn of 2010. 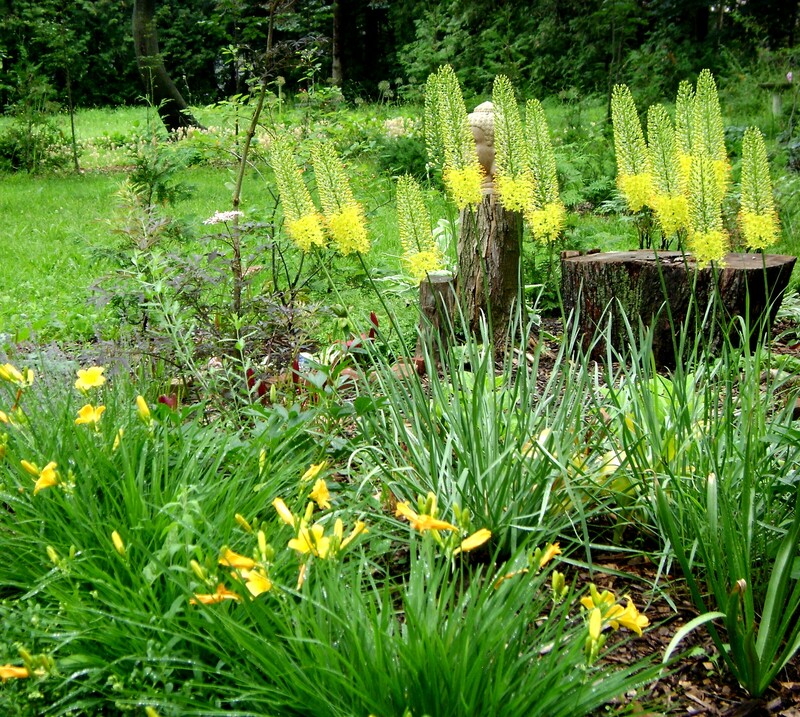 In 2011 I did not have any flowers, and since I planted them right beside my Eremurus bungei or stenophyllus, I wasn’t sure if I had any foliage or not. 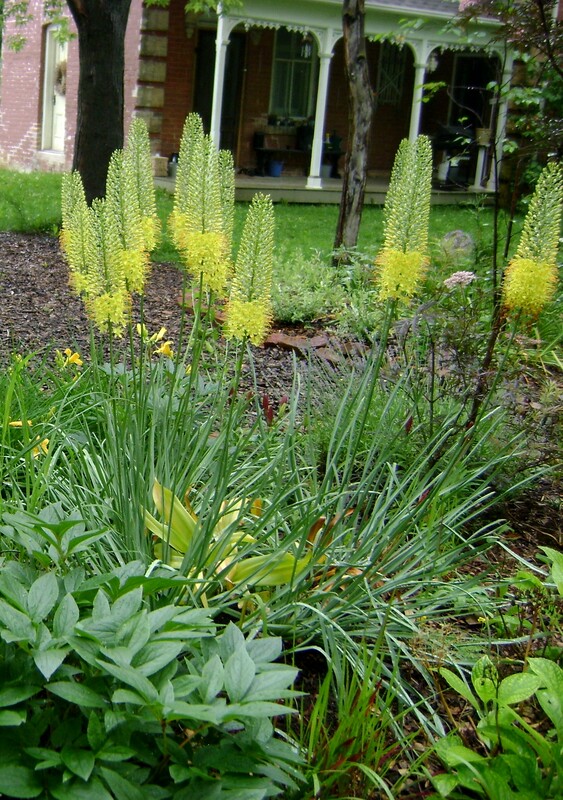 But this year, I was pretty sure that I had two different types of eremurus foliage and sure enough I was right. Three perfect blooms this year, hopefully more next year. 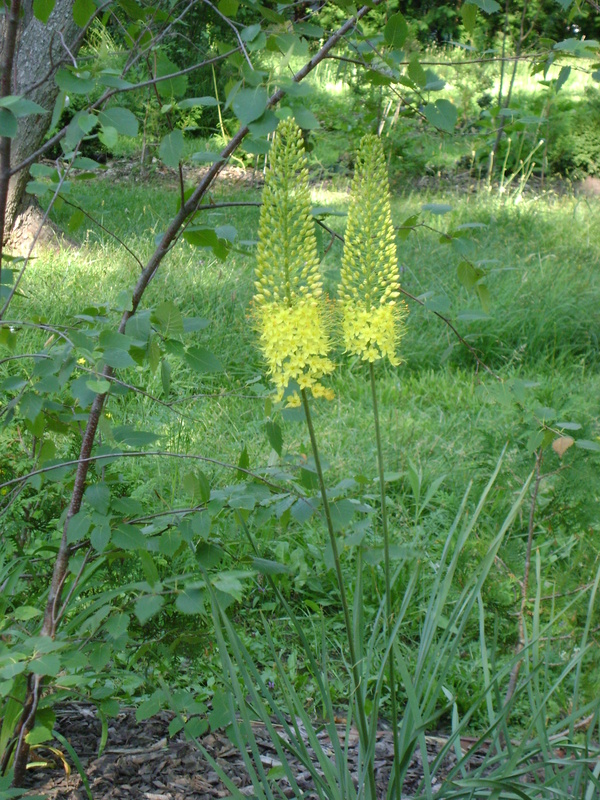 When the eremurus bungei first started flowering in 2009,I only had 2 blossoms. in 2010 there was 13. I counted 24 just before I left for Barbados. I know that I have showed you photos of this plant in my garden before, but I am sooo proud of it. Eremurus seemed to be a plant that even experienced gardeners have problems growing, and especially growing well. So I didn’t have high expectations when I ordered Eremurus bungei from Veseys. It was at the back of their catalogue, under the 3 for 10 dollar category. And when the octopus like roots arrived, I was even more worried. But I planted them in one of the sunniest spots that I have in the garden. And I got results. The first couple of years, just a few flowering stems. But then I had to move them as the birch they were planted beside started to grow and cast more shade. So up they came, and I moved them to the highest part of the garden in the Flora Glade. I had made the bed by piling 2 feet of top soil on top of the existing ground. That should have given them great drainage. And they loved it. There were twice as many flowering stems the following year. What will happen this year? I shall have to send my spies in to find out. Carol, are you listening? I thought that I would try a few Wordless Wednesday posts as I has some pictures I wanted to share, but they were not exciting enough to write a whole post about. So I have published four Wordless Wednesday posts now. They are my lowest read posts!!!!! Why is that? Do you like to hear (read) me ramble on and on, or are my pictures just not as interesting as I thought they were? Do other bloggers also have low readership for these or is it just me? 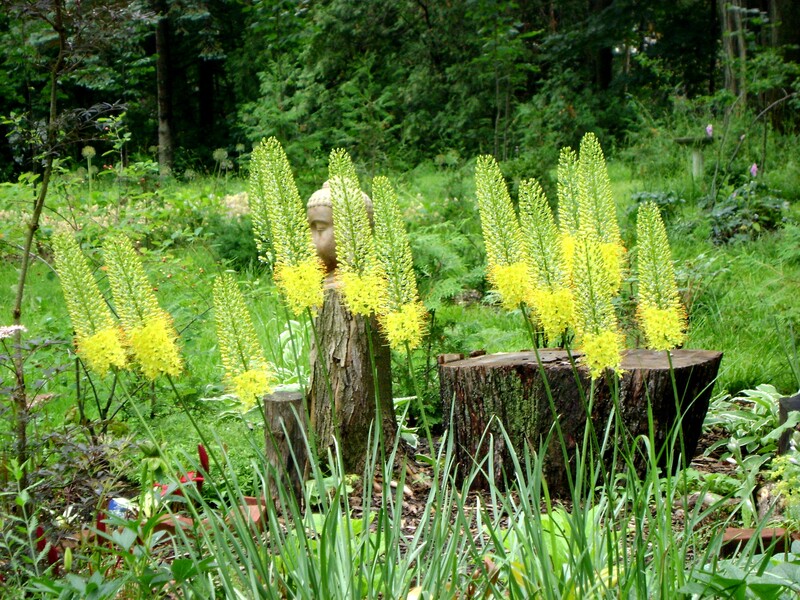 The most beautiful (flowering) plant in my garden right now is Eremurus or Foxtail Lily. love the way the sun catches it. They are also a great cut flower, and very long lasting. If you would like a few more words, you can also read what I wrote about it last year. 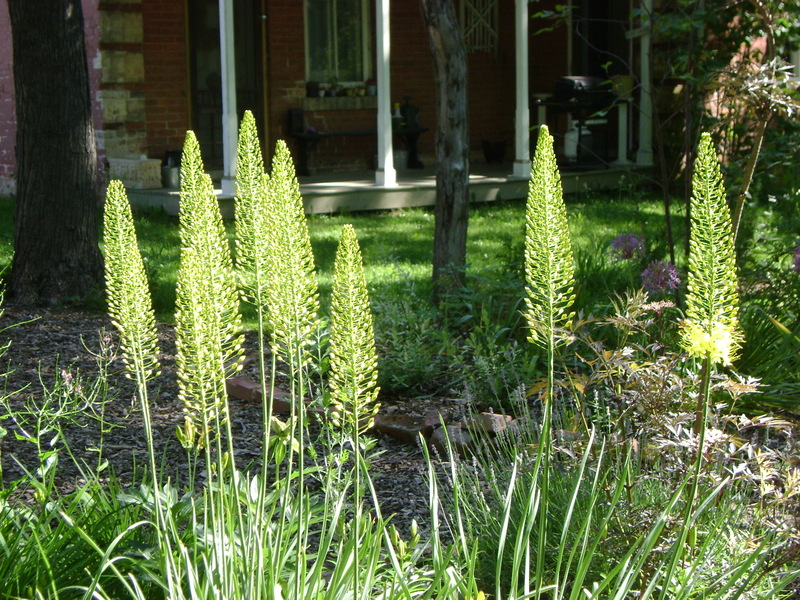 When we went up to Owen Sound this weekend the eremurus was in bloom. I tend to use the latin name, instead of the common name, after an embarrassing incident when I was working at East of Eliza. A woman came in and in a very posh English accent asked if we had any Ampelopsis. I was embarrassed to ask her what it was, had to think for a few minutes to clue in that it was porcelain berry ( I am sure that she thought I was useless). Since then I tend to think of plants in their latin name so it comes easily off the tip of my tongue. Although, when I was working at Kenneth Turner, which was based at Harrods, they called snapdragons, Antirrhinums, and that threw me. This is Eremurus stenophyllus “Bungei” that I got at Veseys. It came from their mail order catalogue, the $10 specials in the back. I got three roots that were shaped like a starfish. Everything that I had read said to plant it with some gravel under the roots as they like good drainage, but I didn’t have any, it was too late to go out and buy any and since I was leaving for Toronto the next morning (4 a.m.), it didn’t get any. What I had going for me was a raised bed (slightly berm like). I planted them in this and you can see the results. According to the Veseys catalogue they are supposed to be blooming in May/June, but it is the middle of July. Either my eremurus didn’t get the memo, or the cold weather has put them off a bit. The catalogue also says that they are a great cut flower, and I can testify to this personally. This time of year, it is the first flower I will use in a design, especially if the customer asks for a modern or masculine arrangement. They last for eons as well, the only drawback is a slightly musky smell, maybe this is one reason their common name is foxtail lily.